We here at First Federal appreciate your business and thank you for choosing us as your financial partner. Our goal is to always provide the highest level of personal and professional service to you. If at any time you have questions, wish for additional information, or have concerns regarding our service, please click here to contact any branch office. First Federal is committed to being a superior community financial institution, offering real estate financing and deposit services at fair and competitive rates, while adhering to the highest standards of business ethics, safety, and excellence in service. We believe that customers are best served when decisions are made at the local level by people who understand the area's unique needs and values. Quality service and a deep commitment to our community have been guiding principles since we were established in 1963. With the highest level of safety, stability, and service in mind, we have a deep appreciation of the trust that our customers put in us. We do banking on a first name basis with a knowledgeable and friendly staff who understands our customers' financial needs. From this perspective, responsible decision making on the local level, while carefully evaluating the risks, is what defines our standard business practice. The story of First Federal exemplifies our commitment to improving Bay Area communities. It began when our founder, Harold Elberg, recognized part of the Bay's heritage would be lost as the older Victorian homes began to crumble and disappear. In June of 1963, Harold decided to establish a Savings and Loan Association to help fund the restoration of these beautiful homes. His vision from the beginning was to become a unique niche lender, serving the needs of the local community. First Federal is currently a lender specializing in multi-residential and commercial real estate loans. Still a traditional savings and loan, First Federal offers outstanding service and competitive rates for individuals choosing to invest in savings accounts, checking accounts, and certificates of deposit. First Federal adheres to conservative loan underwriting standards and does not engage in subprime lending. As a result, the Association's loan portfolio is of the highest quality. Though faces have changed, the philosophies embedded by our founder remain in place. 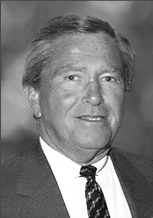 His successor, Marilyn Shaw, shared Mr. Elberg's vision and ran the institution in much the same way. 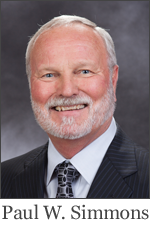 Our current CEO, Paul W. Simmons, continues with the same philosophies of serving our customers and community for the long term. In 1987, the First Federal headquarters was moved to its current location, 1030 Third Street in San Rafael. Today, there are five convenient Bay Area branch locations to serve you. We may be small, but we still have an unwavering dedication to make a difference in our community. 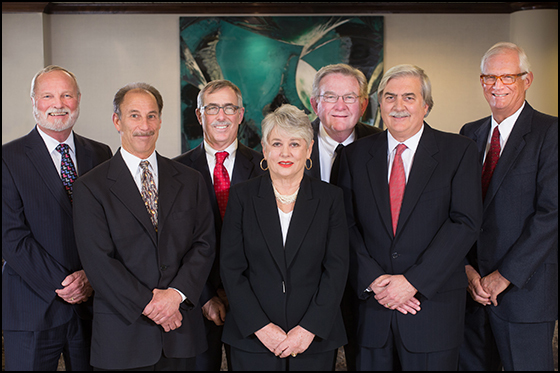 Our Directors possess valuable knowledge in business, commerce, and real estate. Their diverse backgrounds offer invaluable assistance in determining our direction. Each director is a professional in their own right. Having grown up in Marin or the Bay Area, they have a unique understanding of the needs, concerns, and challenges we face as a local community Savings and Loan Association. Our officers each maintain an open door policy. The door is open to staff and customers alike. We welcome you to come visit our brand of community banking. Enjoy some coffee while you accomplish your banking business. We are proud of the service we provide and look forward to building a relationship with you. We want your money to grow and be safe. We believe prudence is a virtue and our health is your health. First Federal has been recognized with an excellent Health Rating at DepositAccounts.com, and is very pleased to be ranked among the healthiest U.S. banks of almost 6,000 banks nationwide. To have earned such a positive rating from an independent source validates our commitment to strong financial performance and stability. Each year DepositAccounts.com evaluates the financial health of every federally insured bank in the United States, and each institution is graded on a variety of factors in order to determine a comprehensive health score. First Federal continues to be recognized for exceptional fiduciary responsibility, receiving an ‘A’ grade for 2018. 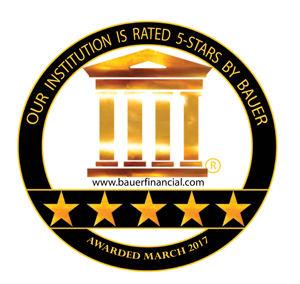 BauerFinancial has been analyzing and reporting on the nation’s banks since 1983 providing ratings you can trust. Earning a 5-Star rating from Bauer indicates that First Federal is one of the strongest banks in the nation. We’ve been around since 1963 and have seen the ups and downs in the industry but, one thing is constant, as a community bank, our strength and stability have always allowed us to excel even in the toughest times.